REPRODUCTION SIGN RETRO STYLE. OR GIVE OUT OUR BANK DETAILS. IF KEPT IN DIRECT SUNLIGHT THESE SIGNS WILL. SIZE 20 X 25 CM 8X10. WE DO NOT ACCEPT MONEY ORDERS. 4 PRI DRILLED HOLES. REPRODUCTION SIGN RETRO STYLE. THESE ARE MODERN SIGNS MADE TO LOOK OLD. OR GIVE OUT OUR BANK DETAILS. IF KEPT IN DIRECT SUNLIGHT THESE SIGNS WILL. SIZE 20 X 15 CM OR 6 X 8. WE DO NOT ACCEPT MONEY ORDERS. 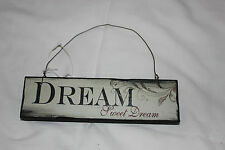 East of India Vintage Wooden Hanging Decoration, Gift, Souvenir *Sweet Dreams* Condition is New Lovely gift moon/star combo for the bedroom Dispatched with Royal Mail 2nd Class. SIZE 30x40CM 12X16. REPRODUCTION SIGN RETRO STYLE. IF KEPT IN DIRECT SUNLIGHT THESE SIGNS WILL. OR GIVE OUT OUR BANK DETAILS. WE DO NOT ACCEPT MONEY ORDERS. 4 PRI DRILLED HOLES. Your favourite Motorbike Sign. High quality 0.7mm aluminium sign. 100% British Made! SIZE 30x40CM 12X16. REPRODUCTION SIGN RETRO STYLE. OR GIVE OUT OUR BANK DETAILS. WE DO NOT ACCEPT MONEY ORDERS. 4 PRI DRILLED HOLES. Your favourite Motorbike Sign. High quality 0.7mm aluminium sign. Rounded corners. A light distressed retro finish with rolled edges all around. Handy pre-drilled holes in each corner for easy hanging. Light speed service. "My dreams of being skinny are always interrupted by the sound of my own chewing.". STAY IN TOUCH SOCIALLY. f wackyplaquey. with 24 hours of receipt. UK Mainland. Four small pre-drilled holes in each corner of this painting, can be mounted on the wall by nails on 4 corners or double-sided tape or blu--tack. 0.12" / 0.3cm. - Pattern: car 18. Sending quick and neat! "The Great Américan Dream". Looking for a decoration or an individualised present?. NEW: UV resistant for long lasting joy - Another proof of our quality compare yourself! If a motiv is missing or you are have an special request- e.g. a picture of your loved one- we will glady manufacture an exclusive sign with your picture or graphic. NEW: UV resistant for long lasting joy - Another proof of our quality compare yourself! If a motiv is missing or you are have an special request- e.g. a picture of your loved one- we will glady manufacture an exclusive sign with your picture or graphic. Looking for a decoration or an individualised present?. Our high quality tin-plate signs are printed in brilliant resolution - 'made in germany'. NEW: UV resistant for long lasting joy - Another proof of our quality compare yourself!